This week's topic from The Broke and the Bookish is: Top Ten Book Covers I'd Frame As Pieces of Art. I'm going to do something a little unusual this week, and instead on concentrating on the pretty, pretty YA covers out there of girls in beautiful dresses, let's look at some of my very favorite picture book artists. I love this spunky redhead! It's true. I have a weakness for dragons. And Michael Hague is one of my very favorite illustrators. I love this book cover. I love all the books that Henkes has done in this style, starting with Kitten's First Moon and including Old Bear and My Garden. If I had to pick just one of his, I'd go with Little White Rabbit, though. I am such a fan of Will Hillenbrand's work. I actually don't know if I'd frame the cover for his collection of Mother Goose rhymes, but I could probably find several of the interior pieces that I'd love to decorate my house with. Here's another illustrator that I totally have a crush on. I love all of her work, so it's hard to pick just one. I especially love the cover she did for Ronia, Robber's Daughter by Astrid Lindgren. But, if I'm keeping with the picture book theme, I'd stick with Little Red Riding Hood. I actually did have a poster of this book cover decorating my office for several years. I'm a huge fan of the Dillons. Again, here's an illustrator that I really admire. I really liked her take on Sun Bread and The Whole Green World. But, The Lion and the Little Red Bird holds a special place in my heart as the first Elisa Kleven book that I ever read. Those original illustrations by Ernest H. Shepard (not the later Disney animations!) have a really sweet and special childhood feeling. What's not to love about this book cover? A redhead librarian overburdened by books... hmmm... sound like anyone we know? Well... 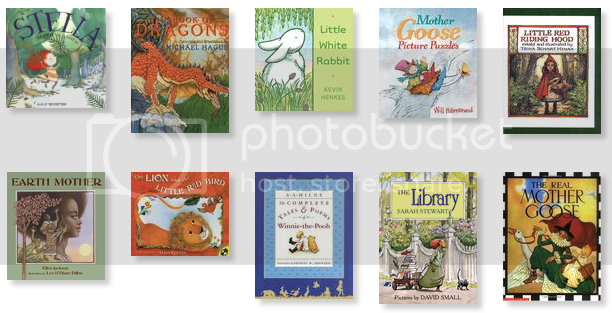 I don't know if I would go for the cover of this classic Mother Goose collection either, but there are literally dozens of illustrations throughout the book that I would love to frame. That's my top 10 list of frameable book covers. What are your favorites?